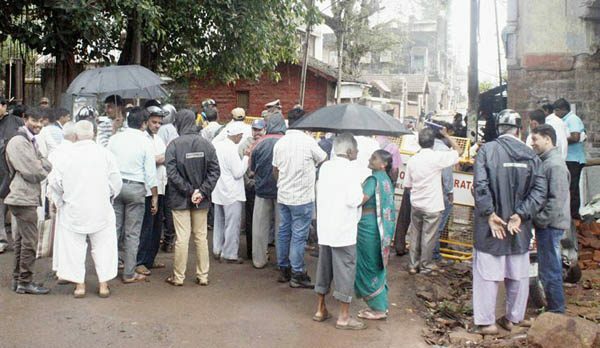 Hundreds of anxious depositors gathered this morning at Swami Vivekanand Marg, where the police got Anand Appugol to his head office of Sangolli Rayana Souhard society and tried to get hold of documents. The police brought him to the office to see what documents can be found and where are the 300 odd crores invested or siphoned off. Sources said even the assets that he has are on loan, like his range rover car and other cars are taken on loan. He has property in form of bungalows in Belagavi in various parts, Hubballi, Bengaluru as well. He has also invested in real estate projects but after demonetization the prices have fallen and his investment in the films also has been a bad debt according to many. Each day depositors come to the HO with a hope that they will get back their deposited money. Many want just their principal and not the interest, but even to get that the wait will be very long. The police custody will end in a couple of days and one will have to see if the court will extend the custody or grant him bail. Just arresting is not enough, govt/police should also take steps to recover the money so that investors get back their money.